Kyoto has a unique cityscape; the most enjoyable part of a Kyoto trip is the charming atmosphere it enraptures.We recommend some of the best Inns that will make your Kyoto trip more enjoyable. When speaking of Kyoto, the cobblestone alleys and black lattice windows are impressive elements visible in the mind’s eye. Akane-an Machiya Residence Inn is located in this traditional Kyoto cityscape. This affordable and luxurious inn is very popular because guest rooms can be rented separately, so it is recommended that you make a reservation as early as possible. Access: Approximately 3 minutes walk from Horikawa Oike bus stop. Rates : Starting from ¥26,000 per night. 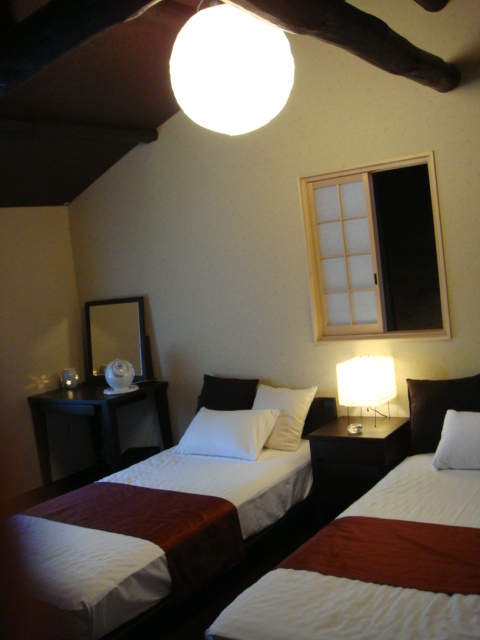 This Inn is ideally located about 7 minutes by car from the Kyoto station. It is close to Nishi Honganji, a world heritage site. You can enjoy the old-world charms of Kyoto from this traditional townhouse. From 6 am begins the “Morning Service” at Nishi Honganji that includes sutra chanting and worship. The Morning Service is open to general public. This is a wonderful opportunity if you are stay at this inn, so please participate and experience the Japanese temple traditions and culture. Access : Approximately 8 minutes by taxi from Kyoto Station. Rate : Starting from ¥12,800 per night. Suo Kakuchi Inn has a modern appearance incorporating latest Japanese designs. The guest rooms are based on cinnabar red tones, which are designed to help you feel the old-fashioned Kyoto style. Despite the appearance of the old-fashioned interior, the inn is equipped with Wi-Fi facilities. The inn has a fusion of good old Kyoto tradition with the latest technology. Access : Approximately 10 minutes walk from Karasuma Station. Rate : Starting from ¥28,000 per night. From this Inn you can view of the panoramic landscape of the Kamo River in Kyoto. This building was used as a Merchant’s Inn during the Meiji era. Elongated floor plans, such as the “Eel Bed” are a unique part of the scenery here. Immerse yourself in the gorgeous high class Kyoto while viewing the Kamo River. Access: Get off Gion-Shijō Station, Keihan Electric Railway then approximately 5 minutes on foot. Rate : Starting from ¥40,000 per night for 2 people. Coming Next – Recently built hotels to enjoy classic Kyoto in contemporary style.